There are multiple parts to this feature – estimated wages, overtime, budgeting, and labor as a percentage of sales. You can use all or parts of it, as needed. To get started, set employees’ wages. Go to Dashboard > Labor Cost. By default, you will land on the employees page. Click the “Edit wages” button by an employee’s name. This will open the employee’s profile, and you can use the options menu (3 dots) by a position to add their pay rate. To get accurate labor cost info, you’ll need to add a pay rate for each employee on your staff. If the rate is the same across a position, you can add the info from the Positions tab on the same screen. This will mean an employee scheduled for a position will have the default pay rate unless you designate something different in their profile. In the next window, you'll be able to add projected sales for each day of the week, maximum labor budget for the week, and maximum labor hours per week. 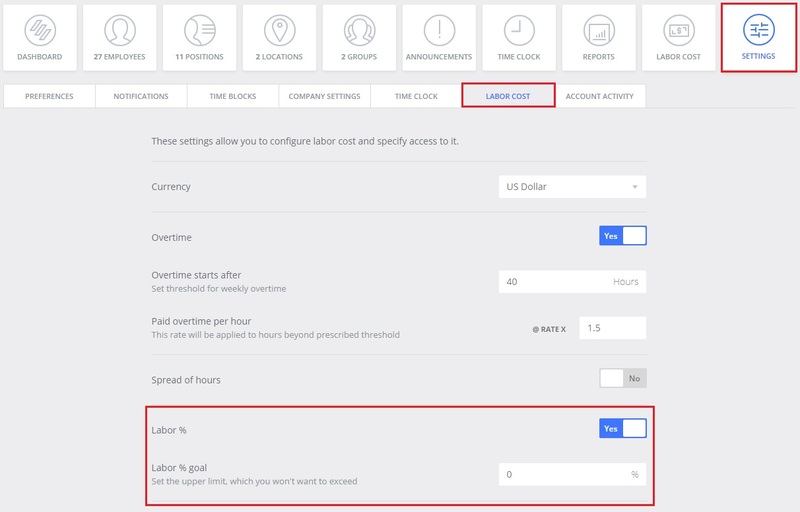 Additionally, you can designate your labor percentage goal so you will get alerts whenever your goal is exceeded. This is set by going to Dashboard > Settings > Labor Cost.